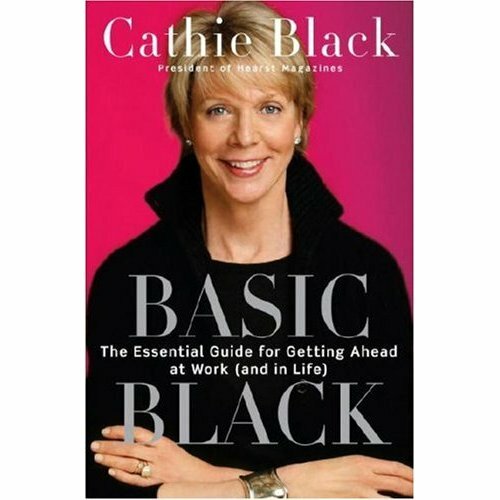 I was asked if I wanted a copy of Basic Black for review, and I said "yes, of course." Cathie Black is the president of Hearst Magazines; I am a magazine junkie: why not? Basic Black is not only very readable (unlike quite a few other how-to-succeed-books I've come across) it's also very enjoyable. Ms. Black has a practical, friendly tone that comes across well on the page, and her advice is of the "this worked for me, I think it will work for you" variety rather than a one-size-fits-all manifesto. The whole book leaves you feeling refreshed and optimistic about the world of work and your place in it. If you want to be an innovator, express yourself like an innovator. Dress in something with verve rather than a corporate uniform. Take your team offsite and do something wacky. Wear a costume to a sales meeting […] and recruit a few others to do the same. Pick a theme — have people dress like cartoon characters. I really wish I'd recruited people to dress like cartoon characters more often. It's absolutely on the to-do list now! One of the things I really appreciated about Ms. Black and her book was that she doesn't think that feminism and business are incompatible. She worked for Ms. and for USA TODAY — and you don't get more mainstream than USA TODAY! And when people grumbled that she hired "too many women" (whatever THAT means) she made her point in a very direct, concrete, and nonconfrontational way: at a holiday lunch for Hearst executives, she was supposed to make some brief remarks after the meal. She stood up and said: "Some people seem to think I hire too many women. I just want you to know I'm listening to their complaints. So I thought I'd do a little survey. Would the women executives please stand up?" A third of the room stands. Then she asks for the male executives to stand … and when dozens of men get to their feet, her point is made. One of her best points, I think, is a slightly-kinder "Get over it," urging women not to dwell on their mistakes but to pick themselves up and move on. "If I needed three days to get over every day I was criticized, I'd never have gotten anything done in my career," she warns. It's more important to get things done than to get things done perfectly, and better to try and fail than never try at all. If you're looking for a book for a recent college graduate, especially one interested in working in publishing or media (or sales, for that matter), this is an excellent choice, and it's not bad for people who have been in the work world for a while, either. She was on Oprah a few weeks ago and was quite good. The only thing I take issue with is her (and everybody else’s) contention that every woman needs a Basic Black Dress. You already know how I feel about that shibboleth! -Lisa S.
I’m glad to hear that the book is good–she’s an amazing woman who doesn’t apologize for her own intimidation factor. I appreciate that. And I love the “get over it” advice. I wish I’d heard it when I was 22. Hm. You may just have found my one sister’s winter holiday gift. I’m adding Basic Black to my wish list.By the way, congrats on the mention in Adorn magazine. I picked up the book at Barnes & Noble and LOVED it, BOUGHT it. Thanks for the tip, Erin. I will pass it on to my daughter (age almost 21) when I finish with it.